Liliane Bettencourt, the world's richest woman, has died, her family said Thursday. Bettencourt, who was 94, was the heiress of the French cosmetics company L'Oreal. She was the daughter of the company's founder, Eugene Schueller. Both Forbes and the Bloomberg Billionaire Index considered Bettencourt the world's richest woman. Her net worth was estimated at around $44 billion. The Bettencourt family currently owns 33% of the L'Oreal Group, which is home to brands like Lancome, Garnier and La Roche-Posay. "We all had a deep admiration for Liliane Bettencourt, who always looked after L'Oreal -- the company and its employees, and was dedicated to its success and development," Jean-Paul Agon, L'Oreal's president, said in a statement. Bettencourt joined her father's company at age 15 as an apprentice, and inherited his stake in 1957. She was actively involved in running the cosmetics giant, and served on the company's board until 2012. She stepped down at the age of 89 and was replaced by her grandson amid a bitter legal dispute with her daughter, who argued Bettencourt was not mentally competent to handle her own affairs. Born in 1922, Liliane Henriette Charlotte Schueller grew up surrounded by servants and high society. She married French politician Andre Bettencourt in 1950, and the couple's only child, Francoise, was born three years later. 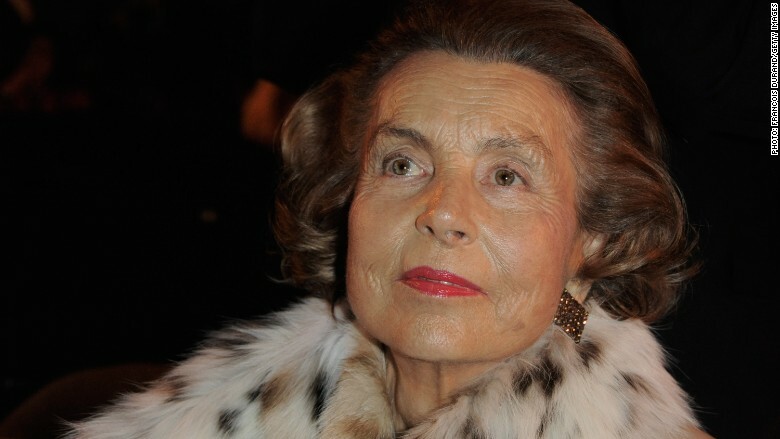 After the death of Andre Bettencourt in 2007, the couple's daughter, Francoise Bettencourt-Meyers, filed a complaint against celebrity photographer Francois-Marie Banier, accusing him of fraudulent exploitation of her mother. He denied the charges. Banier befriended the elderly heiress, 25 years his senior, and had been by her side for the better part of two decades. During that time, he was estimated to have received more than $1 billion worth of cash, valuable artworks and other assets from her. Related: What's next for L'Oreal? At the height of the scandal, when Bettencourt-Meyers sought legal action to have her mother declared incapable of handling her own affairs, the heiress gave a series of feisty interviews in which she told her daughter to mind her own business. "My life is my life," she told one French TV station. During the drama, she remained active, attending L'Oreal strategy meetings and dining with members of France's political and business elite, according to Arnaud Bizot, a journalist who interviewed her for Paris Match. He recounted a busy regime of swimming, walking and yoga -- as well as treatments like acupuncture -- that helped keep her sharp. "When you meet Liliane Bettencourt for the first time, you shake the hand of Madame L'Oreal," he said. The scandal also spilled into the political arena, when it emerged that Bettencourt's butler had been secretly recording her conversations, some of them referencing top aides to Nicolas Sarkozy, who was the French president at the time. Prosecutors launched an investigation into whether Sarkozy accepted illegal campaign contributions from Bettencourt, but later dropped it for lack of evidence. Banier was eventually found guilty of exploiting Bettencourt and ended up receiving a suspended prison sentence.